A customer often perceives the value of an offer differently from the marketer. This can be illustrated with the Lead Gen Fulcrum where the customer’s perceived value of your offer is on one side of the fulcrum and the customer’s perceived cost of that offer on the other end. In this replay of a YouTube interactive session, Flint helps us understand how to think like a customer so that we can tip the balance in favor of value over cost. He looks at several webpage examples and case studies that illustrate how the MECLABS team weighted the value side of the fulcrum while lightening the cost side in the mind of the customer. Viewers will also receive the link where you can download the file he pulls his examples from. This research-backed Lead Gen swipe file contains 22 case studies showing where and how improvements to webpages and emails were made. This is a great resource to have on hand for improving your own webpages. Come budget time, do you have an easy way to show all the results from your testing? Not just conversion lifts, but the golden intel that senior business leaders crave — key insights into customer behavior. To help you do that, we’ve created the free MECLABS Institute Test Discovery Tool, so you can build a custom discovery library for your organization. This simple tool is an easy way of helping your company create a repository of discoveries from its behavioral testing with customers and showing business leaders all the results of your testing efforts. Just click the link below to get yours. In addition to enabling you to show comprehensive test results to business leaders, a custom test discovery library for your brand helps improve your overall organization’s performance. You probably have an amazing amount of institutional knowledge stuck in your cranium. From previous campaigns and tests, you have a good sense of what will work with your customers and what will not. You probably use this info to inform future tests and campaigns, measure what works and build your knowledge base even more. But to create a truly successful organization, you have to get that wisdom out of your head and make sure everyone in your marketing department and at your agencies has access to that valuable intel. Plus, you want the ability to learn from everyone in your organization as well. 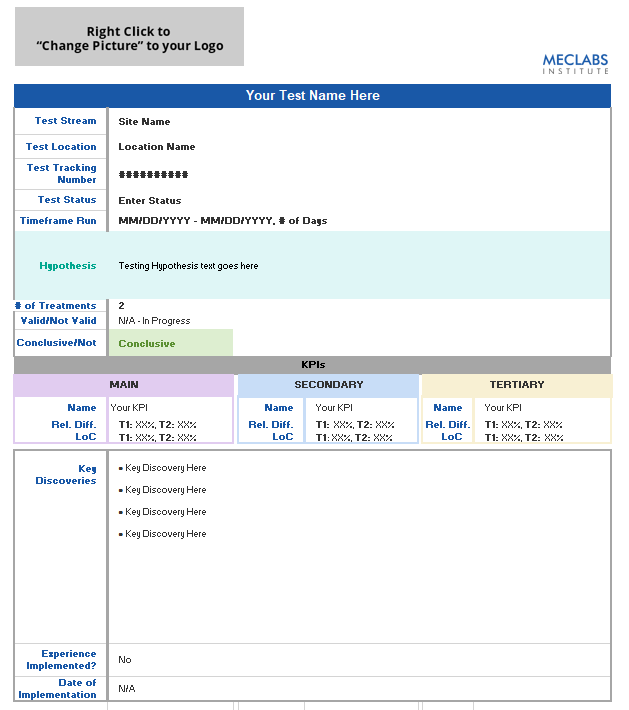 This tool was created to help a MECLABS Research Partner keep track of all the lessons learned from its tests. “The goal of building this summary spreadsheet was to create a functional and precise approach to document a comprehensive summary of results. The template allows marketers to form a holistic understanding of their test outcomes in an easily digestible format, which is helpful when sharing and building upon future testing strategy within your organization. The fields within the template are key components that all testing summaries should possess to clearly understand what the test was measuring and impacting, and the validity of the results,” said Delaney Dempsey, Data Scientist, MECLABS Institute. “Basically, the combination of these fields provides a clear understanding of what worked and what did not work. Overall, the biggest takeaway for marketers is that having an effective approach to documenting your results is an important element in creation of your customer theory and impactful marketing strategies. Ultimately, past test results are the root of our testing discovery about our customers,” she explained. For a deeper exploration of testing, and to learn where to test, what to test and how to turn basic testing data into customer wisdom, you can take the MECLABS Institute Online Testing on-demand certification course. Test Stream: Group tests in a way that makes the most sense for your organization. Some examples might be the main site, microsite, landing pages, homepage, email, specific email lists, PPC ads, social media ads and so on. Test Location: Where in your test stream did this specific test occur? For example, if the Test Stream was your main site, the Test Location may have been on product pages, a shopping page or on the homepage. If one of your testing streams is Landing Pages, the test location may have been a Facebook landing page for a specific product. Test Tracking Number: To organize your tests, it can help to assign each test a unique tracking number. For example, every test MECLABS Institute conducts for a company has a Test Protocol Number. Timeframe Run: Enter the dates the test ran and the number of days it ran. MECLABS recommends you run your tests for at least a week, even if it reaches a statistically significant sample size, to help reduce the chances of a validity threat known as History Effect. Hypothesis: The reason to run a test is to prove or disprove a hypothesis. Do you know how you can best serve your customer to improve results? What knowledge gaps do you have about your customer? What internal debates do you have about the customer? What have you debated with your agency or vendor partner? Settle those debates and fill those knowledge gaps by crafting a hypothesis and running a test to measure real-world customer behavior. # of Treatments: This is the number of versions you are testing. For example, if you had Landing Page A and Landing Page B, that would be two treatments. The more treatments you test in one experiment, the more samples you need to avoid a Sampling Distortion Effect validity threat, which can occur when you do not collect a significant number of observations. Valid/Not Valid: A valid test measures what it claims to measure. Valid tests are well-founded and correspond accurately to the real world. Results of a valid test can be trusted to be accurate and to represent real-world conditions. Invalid tests fail to measure what they claim to measure and cannot be trusted as being representative of real-world conditions. Conclusive/Inconclusive: A Conclusive Test is a valid test that has reached the desired Level of Confidence (95% is the most commonly used standard). An Inconclusive Test is a valid test that failed to reach the desired Level of Confidence for the primary KPI (95% is the most commonly used standard). 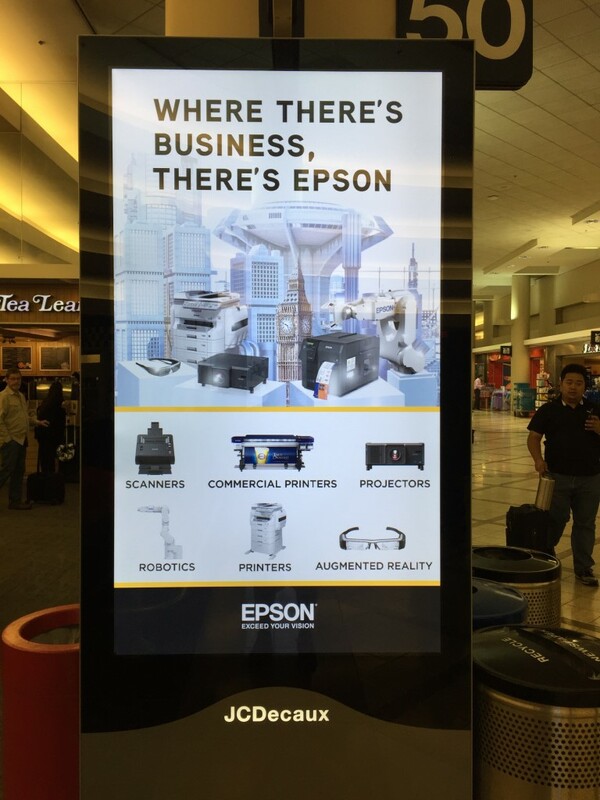 Inconclusive tests, while not the marketer’s goal, are not innately bad. They offer insights into the cognitive psychology of the customer. They help marketers discover which mental levers do not have a significant impact on the decision process. Key Discoveries: This is the main benefit of running tests — to make new discoveries about customer behavior. This Test Discovery Library gives you a central, easily accessible place to share those discoveries with the entire company. For example, you could upload this document to an internal SharePoint or intranet, or even email it around every time a test is complete. The hypothesis will heavily inform the key discoveries section, but you may also learn something you weren’t expecting, especially from secondary KPIs. What did the test results tell you about the perceived credibility of your product and brand? The level of brand exposure customers have previously had? Customers’ propensity to buy or become a lead? 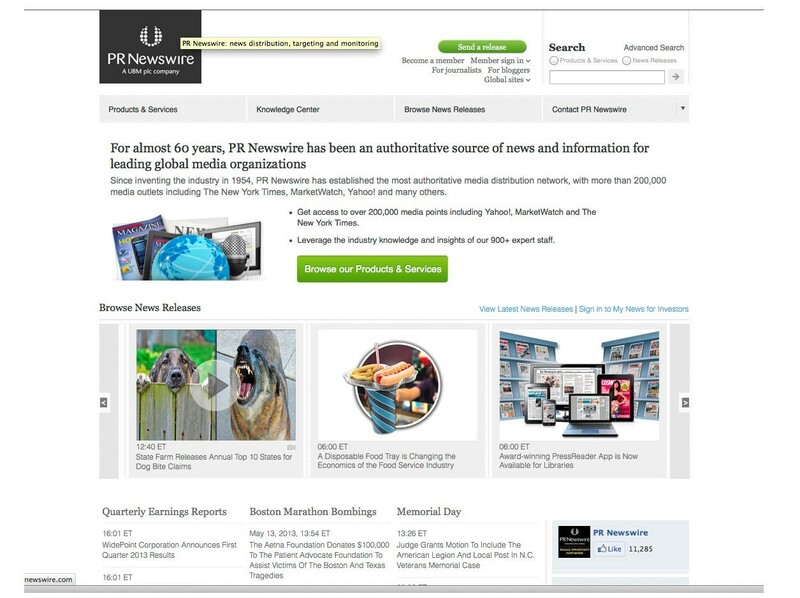 The difference in the behavior of new and returning visits to your website? The preference for different communication mechanisms (e.g., live chat vs. video chat)? Behavior on different devices (e.g., desktop vs. mobile)? These are just examples; the list could go on forever … and you likely have some that are unique to your organization. Experience Implemented? This is pretty straightforward. Has the experience that was tested been implemented as the new landing page, home page, etc., after the test closed? Date of implementation: If the experience has been implemented, when was it implemented? Recording this information can help you go back and make sure overall performance correlated with your expectations from the test results. Manually enter the test as “7” in cell A9. The remaining cells dynamically pull the data in. However, since you copy/paste, they are still referencing the test above. To update this, highlight select row 9 again. On the Home Tab>Editing, select “Find & Select (located on the far right)>”Replace,” or use “CTRL+F”>Replace. All cells in the row should now reference your new tab, “Your Test Name (7)” properly. Special thanks to Research Manager Alissa Shaw, Data Scientist Delaney Dempsey, Associate Director of Design Lauren Leonard, Senior Director of Research Partnerships Austin McCraw, and Copy Editor Linda Johnson for helping to create the Test Discovery Library tool. The post Get Your Free Test Discovery Tool to Help Log all the Results and Discoveries from Your Company’s Marketing Tests appeared first on MarketingExperiments. Website optimization has two approaches — tactical and strategic. 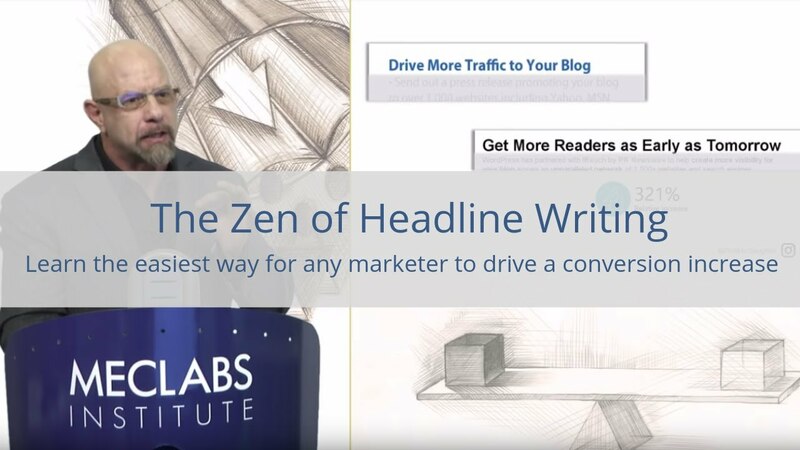 Improving your headline, providing good testimonials and changing form fields are examples of using a tactical approach to add value to your webpages. It is necessary but generally provides only incremental increases in conversion. A strategic approach, on the other hand, addresses root issues on your pages and can lead to a great increase in customer conversions. In today’s Quick Win Clinic, Flint McGlaughlin begins by using a tactical approach to optimize the landing page of payroll services company Affinity. The webpage already has a lot of good things going for it. He offers some ideas for adding value to the page and reducing friction. Watch this video to discover a strategy that can put you ahead of your competitors by adding an incredible amount of value for your customers. The post Optimizing Tactics vs. Optimizing Strategy: How choosing the right approach can mean all the difference in your optimization efforts appeared first on MarketingExperiments. Successful businesses put their customers first. It is crucial that the messaging and design of your webpages show that you value your customers, and their satisfaction is your number one goal. In order to begin to build this trust, when people visit your website they need to feel they are speaking to a person. This means that you must have a conversation with your visitors. Your webpage personifies your company. But you can’t do this if you don’t talk to people. You need to consider who you are speaking to and try to be relevant to them. Furthermore, the design of your webpage needs to reflect this messaging. Design is a part of the message; the message is part of the design. In today’s Quick Win Clinic, waste disposal site EnviroAlaska has a poor design and doesn’t have any conversational text whatsoever. One might be tempted to alter the design to make the page look better. However, McGlaughlin advises to first get the messaging right, then work on the design. Begin by not only using complete sentences but start a conversation. Offer clear explanations of your service rather than making declarations. As you watch the video, ask yourself if your webpages are truly putting the customer first. Are you talking TO your prospective customers or talking AT prospective customers? Furthermore, does your design support and enhance your message? The post Do Your Pages Talk TO Customers or AT Customers? Why the subtle shift in message makes all the difference appeared first on MarketingExperiments. In today’s Quick Win Clinic, Flint McGlaughlin looks at the home and product pages for Worthington Direct, an online furniture store for businesses and schools. It is obvious that everything on this site is designed to help visitors find the product they are looking for and to convince them that the product is right for them. But there are many online furniture stores. Why should visitors choose this company over others? This retailer fails to answer that crucial question. The designers of this website made a mistake the McGlaughlin believes is the number one flaw most ecommerce stores make today. If you offer the right product, but you neglect to show that you are also the right company, then you have lost a sale. Your copy on this page needs to help me draw a sense of certainty inside that not only is this the right product but you are the right company. Watch the video to get further insights into creating webpages that produce maximum results. The post The Essential Messaging Component Most Ecommerce Sites Miss and Why It’s Deterring Your Customers from Purchasing appeared first on MarketingExperiments. The post Beware of the Power of Brand: How a powerful brand can obscure the (urgent) need for optimization appeared first on MarketingExperiments. This was a big year for MarketingExperiments. In 2017, our website got a major facelift. Certainly, a much different look than when we first started publishing in 2000. More importantly, we hope 2017 was a big year for you. And to help you have an even better year in 2018, here is the MarketingExperiments content that was most popular with your peers this past year. New in 2017, we launched the Quick Win Clinic video series to help marketers with problems that are easy to solve, but difficult to detect. 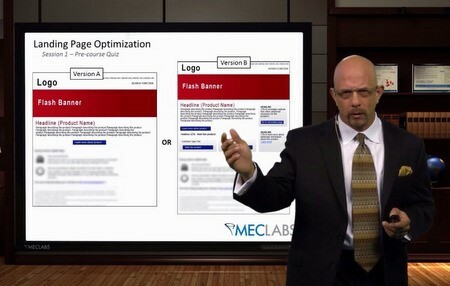 In every episode, Flint McGlaughlin, Managing Director and CEO, MECLABS Institute (parent research organization of MarketingExperiments), provides conversion optimization suggests on audience-submitted homepages, landing pages, emails, display ads, etc. Watch one of the Quick Win Clinics to get ideas for improving your marketing messaging. Or give us the URL of the marketing collateral you would like to have optimized in the series. If yours is chosen, you’ll get specific advice to help improve conversion based on our patented methodology built from what we’ve discovered by testing more than 20,000 sales and marketing paths. Get some ideas for creating a powerful value proposition for your brand, products and marketing pieces from the article 6 Good (And 2 Bad) B2B And B2C Value Proposition Examples. Flint McGlaughlin was a featured speaker at MarketingSherpa Summit 2017 (MarketingExperiments’ sister publishing brand). We shared a free video replay of his full session. Watch now to learn how to bridge the dangerous gap between the results you want and the results you have. A perennial favorite, we published this article back in 2013 but it is still one of our top-trafficked pages, so marketers continue to see value in learning how to understand and communicate their results. As an example, Kyle Foster used a simple A/B split test for a hypothetical landing page test with some dummy data to interpret. Read the article about interpreting results to get a basic understanding of how you should report on your A/B tests. Lastly, another perennial favorite, the landing page for MECLABS online learning. With our curriculum of online certification courses — value proposition development, landing page optimization, online testing and email messaging — you can learn a patented methodology to increase customer response. The post Most Popular Marketing Experiments Conversion Optimization, A/B testing and Value Proposition Content in 2017 appeared first on MarketingExperiments. Let’s suppose you have been perusing our website for a while now and have been educating yourself on landing page optimization. You are in the process of revamping a webpage and feel like you have arrived at a good value proposition. It’s well expressed in your headline and has further enticing information in the subheader. The graphics are good. You now think you’ve captured visitor’s attention. What’s next? In this Quick Win Clinic, Flint McGlaughlin views a page from Core Hospitality Furniture that has several positive factors going for it. Our attention is captured. But just as the conversation gets rolling, it seems to end and we are left hanging, even a little confused. Watch the video to see where the mistake was made, and get some free advice on how to keep the conversation going with the customer so that they will be able to arrive at a conclusion, which powers a decision that is mutually beneficial to both customer and brand. The post Page Layout Optimization: A common mistake marketers and web designers make, and how to avoid it appeared first on MarketingExperiments.